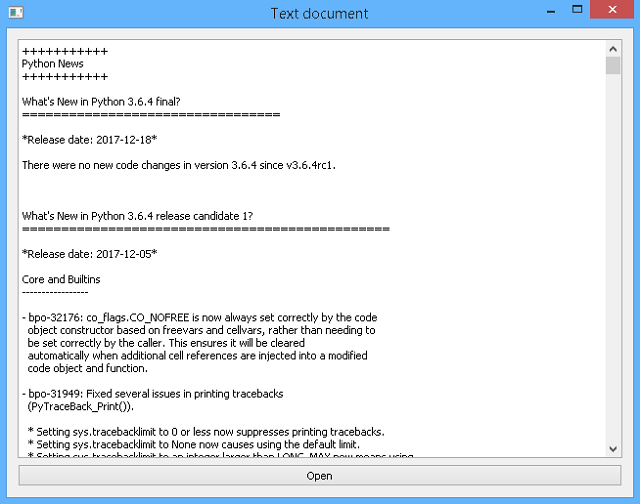 python-catalin: Python Qt5 - QFileDialog and QTextEdit example. Python Qt5 - QFileDialog and QTextEdit example. This tutorial is about QFileDialog and how to use it. First you need to create a default PyQ5 application and add your method is called by my_OpenDialog. This will be connected to one button. My application uses the QTextEdit to show HTML and text files. If you try to see another file this will open badly. I set the completeSuffix just for HTML and text. As you know this returns the complete suffix (extension) of the file. The content of this file is put into QTextEdit widget create and named editor_text.